Casio just announced some new point-and-shoots in its EXILIM line, including the "world's smallest and thinnest 10-megapixel camera," the EX-S10. Look, I'm as excited as the next guy that you've managed to make a 15-mm-wide camera, but if it takes crappy photos I could really care less how small it is. And with the EXILIM line already known for having a bit of a form-over-function problem, I'm pretty skeptical that this thing can hang with cameras that aren't quite so thin. Hit the jump for the presser with details on this and the rest of the new point-and-shoots. 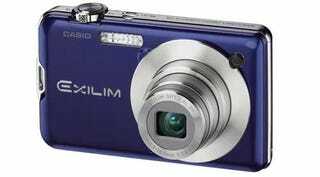 Casio's EXILIM series was born with the appearance in 2002 of a "wearable card camera" — a digital camera with a very slim form. The new EXILIM Card EX-S10 maintains all of the powerful functionality of the cameras that were later developed in that line (high pixel count, zoom functionality, LCD monitor, photo functions, etc.) but it also embodies a return to a stylish thin form and a strong design presence. * As at January 6, 2008, for 10-megapixel class digital cameras. Based on Casio survey. The camera's stylish body, measuring 94.2 mm wide, 54.6 mm high and 15.0 mm thin (13.8 mm at the thinnest part) is the product of Casio's relentless pursuit of thinness. It is finished according to two design requirements — a high quality feel created by the stainless steel body, and a unique beauty derived from its coloring. The camera comes in four colors — red, blue, silver, and black. This new camera's thinner, smaller body was made possible without sacrificing high resolution image quality using a newly developed 1/2.3 inch CCD. Its high resolution images can be used to create beautiful prints even when enlarged or when the image is cropped. The camera incorporates Casio's newly developed Super Clear LCD. This produces extremely sharp and vivid images, thanks to its high contrast ratio and its 230,160 dot high resolution. The display can be viewed easily from above, below, left or right thanks to its wide viewing angle, and it is extremely bright, making it easy to see even in daylight. Using motion blur detection technology, the camera can automatically take a photo at the instant when hand shake or subject movement ceases. Users can also automatically capture the moment of a smile, the instant when subject movement due to panning ceases, or the moment when their own face fills the frame as they point the camera towards themselves. The camera uses the H.264 video standard, which utilizes the AAC audio codec widely enjoyed in Apple's iPod, etc. It is also possible to record movies in an appealing wide format. The camera also features a Movie Button which makes movie recording easy. The EXILIM Zoom EX-Z80 is a digital camera that features a very compact, tightly formed design which offers the functionality needed to easily take photos and shoot movies, yet also offers a design feel conducive to carrying it around almost like a fashion accessory. It is available in six body colors — pale pink, vivid pink, green, blue, black, and silver. With this model, Casio has sought to create both functionality and design that are "easier" and "more fun." This camera's smart form, with height kept to a minimum, makes it compact enough to be cradled in the palm of the hand. The body features a finely brushed finish, and the contrast with the mirror finish on the ring surrounding the lens accentuates the camera's scintillating presence. Thanks to the use of the EXILIM Engine 2.0 high-performance image processing module, which makes full use of Casio's proprietary technologies, users can enjoy taking beautiful pictures with very low noise with this high performance 8.1 megapixel model. In addition to the usual rectangular focusing frame found on the LCD monitor, users can also choose other playful design, such as a heart shape, for the focusing frame. When the subject is crisply in focus a clear heart shape is displayed, but when the image is not in focus the heart shape breaks up. Not only fun, this is a useful tool that makes it easier than ever to get the focus right. If the faces of the people who users want to be in sharpest focus are prerecorded, the camera can use face detection technology to simultaneously detect up to ten faces. When it recognizes any of the prerecorded faces, it prioritizes them when determining correct focus and exposure. This feature can be useful when ordinary face detection technology would have trouble focusing as desired, such as when a number of people are lined up for a portrait and the picture-taker's family members are at the rear of the group. *The face detection feature includes a face detection technology provided by OKI's face image processing engine, FSE (Face Sensing Engine). The high resolution, 10.1 megapixel EXILIM Zoom EX-Z200 and EXILIM Zoom EX-Z100 models feature an EXILIM series first — a 4x optical zoom lens that can shoot as wide as 28 mm (equivalent). Also, in addition to the usual recognition technologies, the intelligence of these cameras has been enhanced. They incorporate automatic scene differentiation and allow the shutter to be released automatically, thanks to Casio's commitment to keep improving the convenience offered by digital cameras. These cameras allow zoom photography between 28 mm and 112 mm (35 mm film camera equivalent). This increases photographic enjoyment, from wide angle photography suitable for capturing large subjects or shooting up close in small spaces, right through to telephoto work. The new thinner, smaller bodies of these two models were made possible without sacrificing high resolution image quality using a newly developed 1/2.3 inch CCD. Their high resolution images can be used to create beautiful prints even when enlarged or when the image is cropped. The EX-Z200 employs an anti shake function that compensates for blur by moving the imaging element. Of course, both models incorporate Anti Shake DSP, which reduces blur by raising the camera's sensitivity and therefore increasing shutter speeds. These cameras incorporate Casio's newly developed Super Clear LCD. This produces extremely sharp and vivid images, thanks to its high contrast ratio and its 230,160 dot high resolution. The display can be viewed easily from above, below, left or right thanks to its wide viewing angle, and it is extremely bright, making it easy to see even in daylight. These cameras can automatically analyze the scene to be captured and choose an appropriate shooting mode. The six scenes that can be distinguished are: people, scenery, night scenes, night scenes with people, close-ups, and moving subjects. These cameras were also designed to be very user-friendly, and it is easy to quickly change to another shooting mode associated with the scene type that the camera recognizes. These cameras utilize the H.264 video standard, which lets users record beautiful movies with the latest high compression technology. Users can enjoy wide format movies in a 16:9 aspect ratio. These cameras also feature a Movie Button for easy movie recording.